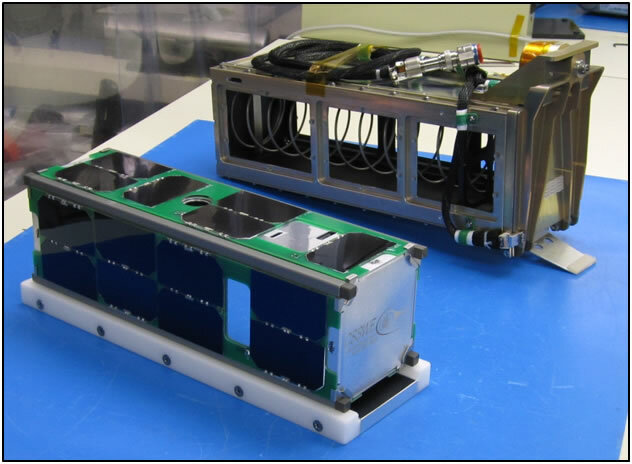 The Miniature X-ray Solar Spectrometer (MinXSS) » What is a CubeSat? CubeSats are very small satellites about the size of a loaf of bread. They come in the standardized units (“U”) of 10 x 10 x 10 cm. The spring-loaded deployers that launch them into space can fit several U’s inside, typically 3U, 6U, or 12U. A single satellite then can optionally occupy all of that space instead of a bunch of smaller ones. MinXSS is a 3U design. The original specifications for CubeSats were released in 1999 by Cal Poly and Stanford University. Since that time, hundreds or thousands of CubeSats have been launched. They continue to be a popular platform for students to gain valuable experience with spacecraft design and manufacturing, as well as a vehicle for low-cost, space-based observations. This image is from another University of Colorado, Boulder & LASP CubeSat, the Colorado Student Space Weather Experiment (CSSWE). Learn more here.